There will be shuttle buses running to and from the ferry terminal to the festival site from Wednesday 10th to Monday 15th July. A return ticket is £6. While on Tiree there are many ways for getting around. 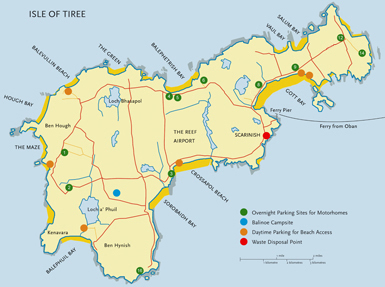 Located at the ferry terminal, MacLennan Motors provides a Car and Bike hire service. Car hire is available for £48 per day and bikehire £10 a day. For more information please call 01879 220 555. There is also a Ring and Ride Bus Service, which is demand responsive and must be booked in advance. This service can be contacted on 01879 220 419. This map highlights the location of the festival site as well as various other points of interest on the Island.